It's Spring. And I'm bummed. I mean, I love the weather, the sunshine, the new plants and flowers popping up everywhere. I love all things about Spring EXCEPT. It's time to lose the winter cover up clothes. It's time to *GASP* start wearing shorts again. And honestly, I am not a young little chickadee anymore. I have that middle aged lady body thing going on. You know: The meno-pot? The turkey neck? The cellulite? We are all supposed to EMBRACE aging. You know---age gracefully and all that. Well, I'm sorry. It's hard. I'll admit. I'm packing a few extra pounds right now. When I told my daughter, "You know, honey? I'm going to embrace this weight! Then maybe it will fall off of me. That's what 'they' say!" She gaped at me, then stated flatly, "Mom. DON'T embrace the weight." LOL. So, I'm still working on it. But that cellulite. The past decade, it's been there even when I'm thin. So---it's just time to do something else. I was going to put some images of cellulite on here, BUT we ALL know what "that" looks like.....so I refrained. But seriously...isn't it just depressing? As I age, I have gotten a lot better about accepting the fact that I no longer have the svelte figure of my twenties...and that's fine to an extent. But I'll be danged if I'm going to just stop fighting the good fight for my health and yes...relative appearance. Here are some natural ways to tackle cellulite, plus a few facts you may not have known! Did you know that most women have cellulite? And did you know there are things your can do to naturally reduce it (or at least its appearance)? It’s Spring! It’s time to wear our skin baring clothes with some joyful abandon, but that’s hard when you are self-conscious about cellulite. Here are some things you can do right now to help improve the appearance of cellulite, and maybe even make it go away. I’ve included my cellulite massage oil recipe for you too! Six Natural Ways YOU Can Fight Cellulite! Here are a few different things you can take action on now to improve your circulation and perhaps even reduce the appearance of cellulite this Spring. Dry skin brushing is WONDERFUL! Dry skin brushing increases the circulation of the skin, stimulates skin cell turnover, exfoliates and rejuvenates your skin, and makes your skin feel amazingly soft. In addition to these wonders, dry skin brushing also improves the flow of lymph fluids in your body, which helps remove those yucky toxins that may contribute to cellulite. You know what? It FEELS TERRIFIC! What a great way to wake up before that morning shower! All you need is a long-handled body brush with natural bristles. They're not expensive, either. Firmly brush your skin, moving the brush toward your heart. I like to start at my calves and move upward, toward my torso. When I reach the chest area, I switch and brush my arms and downward on my chest and back area. You want to brush toward the heart. You'll find your skin will become super soft and smooth by dry brushing every day, too! After you're done, just take a shower! Not only do you get the lymph moving in your body, but your skin will be rosy and smooth! What's not to like? Precautions: You may want to start with more gentle strokes until your skin gets used to it. My skin is a bit sensitive, so I started out on the light side. Here is my dry skin brush. It's a good one, and it didn't cost much either. I got mine at Whole Foods Market, but you can also find one HERE. Coffee grounds contain caffeine, plus they are great for stimulating circulation and exfoliating the skin. The caffeine helps tighten and tone the skin surface temporarily, while the grounds exfoliate. Some people see good results with this method. I have not personally tried this (yet), but I will let you know how it goes when I do. I just don't like the thought of coffee grounds going into my septic tank. I'll figure that one out. Here is a cream with caffeine you may want to check out! **One of our readers suggested an outdoor shower! :-) Just might be the thing to do! You can also add coffee grounds to homemade soap. You don't need to use much in the soap, so it's not a worry about the drain. Here is a recipe for how to make Cellulite Scrubbing Soap and here is another article about How to Make Soap Without Using Lye if using lye bothers you! There are some essential oils that work exceptionally well in helping to tone the skin and even break down fats. These include juniper, rosemary, grapefruit, lemon, etc. These oils also help improve the all-important circulation in your legs and rear, too. Combinations of these essential oils have been clinically shown to improve skin elasticity and also help remove toxins through the skin. I have been using my cellulite massage oil for about a month, and I am beginning to notice more tone to the skin on my legs and rear. Besides all that goodness, it smells WONDERFUL! These essential oils are known for their ability to do any or all of these actions: 1) break down fat cells, 2) increase circulation, and 3) decrease inflammation. (Starwest Botanicals carries excellent essential oils in a variety of sizes. That's where I buy most of my essential oils. The links above are to Amazon through Plant Therapy, and they are good too! I also like Rocky Mountain Oils. ** You will also need a Carrier Oil such as Sweet Almond Oil (I am fond of this oil because it is highly emollient, soaking into your skin quickly.) You can use Fractionated Coconut Oil or Grapeseed Oil is good too. There are many many others as well. ** You'll also need Amber glass bottles for storage. Place the essential oils in a 4 ounce Amber glass bottle with a dropper. Gently swirl the essential oils together. Fill your container with your carrier oil of choice. I like Sweet Almond Oil. I like to combine the Almond Oil with a bit of Jojoba Oil too. Safety Note: Don't use juniper or rosemary essential oil massage at night! It may actually keep you awake. These are very stimulating oils. Also--if you have high blood pressure or are on any medications, please seek advice from your physician before using any essential oils or herbs. Rosemary, in particular, can affect the heart, as it may increase circulation. **You may also be interested in making a Juniper-Rosemary Salt Scrub! Now let's move on to some more tips for battling cellulite! Blending essential oils is easy! I like to make extra and store the blend away to make more massage oils later on. Pouring the almond oil into the jar with the essential oils. I use a funnel because it makes it a LOT less messy! I am a big fan of herbal loose leaf teas, the fresher the better. I like these kinds of teas because you are getting the nutrients of the herbs, and with the proper combination of herbs, you can really support weight loss. I like to combine herbs that help with cleansing/detoxing (diuretics) with herbs that enhance and support energy (green tea and eleuthero) and others that help your circulation and heart. You can buy excellent quality bulk herbs from Starwest Botanicals. They also carry many tea blends already created for you! I've written a great eBook, Learn to Create and Prepare Your Own Herbal Teas for Pleasure and Health! I've included over 22 recipes to get you started. My favorite Weight Loss Support Tea is included in the book along with many other great tea blends. There's also directions for creating your very own blends for your needs too along with loads of information so you can blend tea with confidence. If you are not into herbal tea, you might find this next tidbit is pretty good news! Try using Cayenne Pepper and Lemon Juice in your cooking or in your water every day. That's the simplest tea blend ever for helping fight the appearance of cellulite! Blah-- I know, I know! And I fight with this one too! It's really hard to find the time when you work one (or two or more) jobs, have children, have...a LIFE! But exercise does absolutely help reduce the appearance of cellulite. There is nothing like a good sweat to get rid of junk from your body, help tone those muscles, and release feel-good endorphins! Yep. It's Spring. I'm trying not to be glum about it. But you know what? I'm going to put ALL these tactics into my daily ritual NOW so I can wear my skin baring dresses and pants with confidence and a carefree spirit. I know that's being hopeful at my age, but it's time to just do something and move on. That's all we can all do, right? 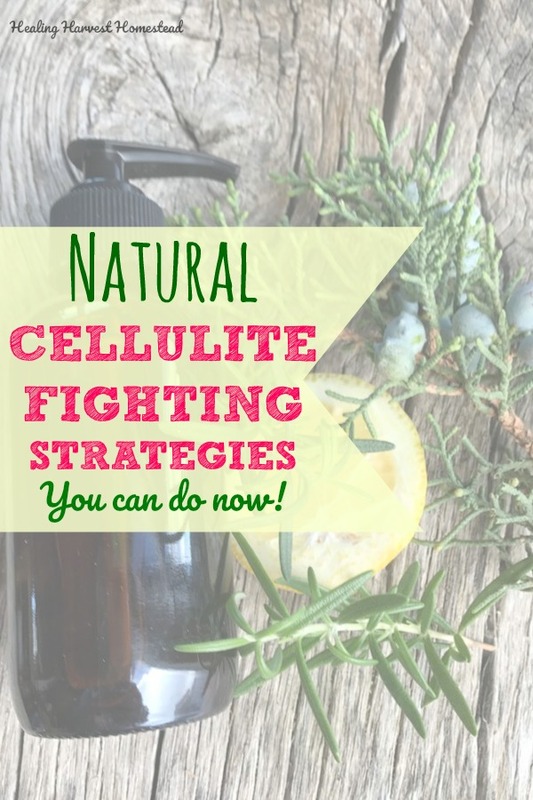 Using natural methods to help combat cellulite takes consistency, effort, and some creativity. Some of these solutions are easier than others. I suggest picking two, three, or even more of these cellulite fighting strategies to start and do them consistently over a period of 30 days and see what happens! The best thing about taking measures to reduce cellulite is that in the process, you will be getting healthier! P.P.S. Hey! You may also be interested in reading these related articles: How to Naturally Makeover Your Spring Skincare Routine, How to Make Juniper-Rosemary Salt Scrub. This is an amber glass pump bottle---perfect for massage oils! Disclaimer: I am not a medical doctor, and the ideas, procedures, and suggestions in this article are not intended as a substitute for the medical advice of a trained health professional. All matters regarding your health require medical supervision. Consult your doctor before adopting the suggestions in this article or elsewhere in the website. I disclaim any liability arising directly or indirectly from the use of any of the information in this article or website.